Truck drivers play an important role in the economy and supply chains by transporting and delivering goods. The need for truck drivers stands to increase as the demand for goods rises; in fact, truck driver employment is projected to grow 5% by the year 2024. When most people think of truck drivers, they think of long-haul big rig drivers, but there are many different types of truck driving jobs that may be available to you once you hold your commercial driver's license. Long haul drivers, also known as Over the Road drivers, typically drive heavy tractor-trailer trucks over hundreds or even thousands of miles to deliver goods. These drivers can go interstate (driving across more than one state) or intrastate (within one state), and can be on the road for days or weeks at a time to deliver their haul. Because of the long distances and time commitment associated with long haul truck driving, some drivers choose to work in a team rather than alone to maximize their time on the road. Typically in a team setting, one person drives while the other sleeps in the cab area and vice versa, thereby cutting down on stops. School Bus Drivers - as the name implies, this type of bus driver transports kids and students to and from school and other extracurricular activities. Charter Bus Drivers - this type of bus driver transports groups of people on trips or sightseeing tours. This type of driver is hired to transport passengers based on their preferred time schedule (as opposed to a pre-designated timetable) and typically stays with the passengers for the duration of the trip. Local Bus Drivers - these drivers follow a set daily schedule and transport passengers to and from designated stops within a city. These types of buses serve the general population and often take passengers to and from work or other appointments. Intercity Bus Drivers - this type of bus driver takes passengers on longer haul trips to and from different cities and/or states. Most urban areas offer intercity bus travel. There is a big market for truck drivers who can haul specialty freight such as exotic cars, livestock, military equipment, and other unusual items. Specialty cargo haulers are sometimes needed for oversized or heavy weight loads, or double/triple trailers. Some of these drivers hold special endorsements to allow them to haul certain specialty items, as they can have additional regulations and are often high value cargo. This type of truck driver hauls hazardous materials (HazMat for short) and requires a specialized endorsement to do so. The type of goods that require a HazMat driver include gases, radioactive materials, flammable/combustible liquids or solids, explosives, and more. Aside from having the special endorsement, HazMat drivers need to be incredibly safety-minded and diligent about following the correct protocol for such potentially dangerous cargo. If you are interested in working for yourself, becoming an independent truck driver might be for you. This type of driver hauls freight on a contract basis and owns his or her own truck(s) and equipment. 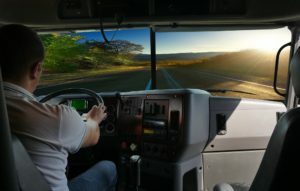 While this type of driver has the freedom to choose which jobs are taken and when, it is important to note that all overhead expenses including truck maintenance, insurance, fuel, and other costs will be the responsibility of the driver.